Every Christmas season, Arlington National Cemetery’s grave sites are decorated with Christmas wreaths with red ribbons to honor those who have given their lives to provide the freedoms we enjoy in our United States of America. The cemetery is transformed into a vision of beauty, and the families of those buried at Arlington take comfort in seeing the respect that is shown to their grandfathers, fathers, mothers, sons, daughters, brothers, sisters, unknown Americans, etc. who so loved our country. 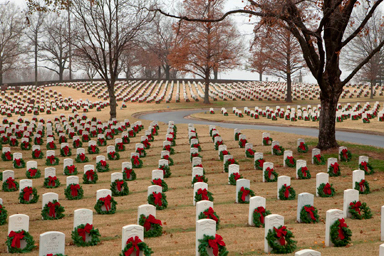 Fort Smith, Arkansas has a national cemetery that, up until 2009, received very little attention during the Christmas season. In fact, a small handful of grave sites are all that enjoyed the beauty of Christmas decorations. Otherwise, the cemetery is barren of any symbols of appreciation to those who served our country. In 2009, a group of community volunteers decided to change this and a local program was born- Christmas Honors. This group of volunteers decided that every headstone will receive a wreath. It’s all or none. In 2009, over 1,000 volunteers participated in event. 12,000 wreaths and ribbons were needed to decorate each and every grave site at the United States National Cemetery at Fort Smith. Volunteers worked together on a Friday, December 11th at the Fort Smith Convention Center to assembly the 12,000 wreaths and distribute them along the curbside at the cemetery in preparation for the laying of the wreaths the next day. Volunteers of all ages and backgrounds joined together to accomplish this task in an amazing six hours! Saturday morning on December 12, 2009, Christmas Honors, began with a dedicated time for families of service men and women to place wreaths on their loved ones followed by a community-wide effort to distribute wreaths on every headstone. A brief ceremony during the event reminded everyone of the important role each person played in the life we live today. In January it was time to collect, dry and store the 12,000 wreaths in over 1,000 boxes. A team of volunteers worked tirelessly to respectfully handle the wreaths so that they would be in good condition for the upcoming years. It was the Christmas Honor’s team’s dream to start a tradition that would long outlast them, thus providing the service men and women and their families with a symbol of gratitude during the holiday season. Every year that tradition continues to build. Each December, thousands of community volunteers from all over the region come together to transform the United State National Cemetery at Fort Smith by placing one wreath on each of the thousands of headstones in honor of every man and woman’s service to our country. Present appreciation to veterans and their families such that they will never be forgotten.